And we are Truly Dedicated to Your 100% Satisfaction. Your Comfort is Everything! our ONLY business. What does our Dedication mean to you? THE MOST COMFORTABLE MATTRESS HEAVENLY POSSIBLE FOR YOUR BODY! AT Latex-PEDIC ALL OUR MATTRESSES ARE 100% PURE TALALAY Latex. Our standard Latex Mattress is a solid core of 6" of 100% Pure Talalay Latex. Available in Soft, Regular Firm, Extra Firm and Ultra Firm. 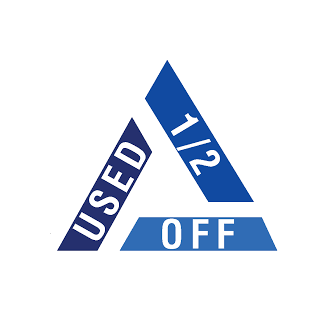 Whether you're looking for a NEW or USED Mattress, or just needing to RENT a Mattress, you're in the right place! Latex is defined as: Any of several natural or synthetic colloidal polymers suspended in an aqueous solution. Natural Latex is a milky substance harvested from rubber tree plants (Havea brasiliensis) which are grown in tropical climate plantations around the world. Most are located in Africa, Malaysia, South America, and Indonesia. Natural Latex is bio-degradable and naturally resistant to mold, mildew & bacteria. Harvesting the liquid Latex is similar to tapping trees for maple syrup. The trees are not harmed, providing a sustainable resource. The Latex is collected in buckets and shipped to large rubber factories such as B.F Goodrich, Dupont, etc. for processing. Natural liquid Latex is a commodity that and publicly traded in stock markets around the world similar to corn, pork bellies, orange juice etc. Synthetic Latex is a man-made molecular copy of natural Latex. The scientific name for this compound is Styrene-Butadiene (SBR). Styrene is named for "styrax", the resin from a Turkish tree. Low levels of styrene occur naturally in many kinds of plants as well as a variety of foods such as fruits, vegetables & nuts. Butadiene is produced by dehydration of butane obtained from petroleum. Butadiene is also used in the manufacture of Latex paints and nylon fibers used in rope and clothing. Blended Latex is just what it sounds like, a combination of Natural Latex and Synthetic Latex mixed together. WHICH Latex IS BEST FOR ME? This is a question thatand answer can depend on your perspective. All Latex formulas offer numerous benefits to consumers that far outweigh the benefits of conventional foam bedding materials. Keep in mind that while Latex formulations are contrasted with each other below, all Latex rubber significantly outperforms foams such as memory foam or traditional polyurethane foam for durability, pressure relief and sleep benefits. Natural Latex, as its name implies, is "natural" which offers many benefits for use in sleep products. Consumers that have an organic lifestyle and have made numerous changes to remove most synthetic chemicals from their household tend to purchase 100% natural formulations. The elasticity, healthiness, and ability of Natural Latex to conform to your body, reducing pressure on your muscles and circulation is unsurpassed. The resulting benefits and luxurious comfort simply can't be matched by synthetic Latex. However, because it is a "natural" product there are inconsistencies at the molecular level which cause Natural Latex products to wear at a faster rate than Synthetic Latex. Synthetic Latex is extremely uniform at the molecular level, so sleep products will have greater durability than those made solely with Natural Latex. However, what you gain in durability you lose in feel and sleep benefits as compared to Natural Latex. When consumers want to know a product is natural and good for the environment while also looking for a product that will help them sleep better with optimum value for their money- they purchase blended Latex. By combining Natural and Synthetic Latex together you get the best of both worlds. Natural components, elasticity, conformity, health benefits and luxurious feel from Natural Latex combine with extended durability from Synthetic Latex- to make a product that the Earth provided and we perfected. Blended Latex can be compared to a gold wedding band. No one has a 24 carrot(100% gold) wedding band because it would be too soft and bend if gripped too hard. The solution is an 18 carrot gold ring where the gold is mixed with another, more durable metal. The result is a ring that has the look and feel of pure gold but is less vulnerable to damage or wear. The terms "Talalay" and "Dunlop" refer to the two different methods of manufacturing Latex Rubber for sleep products. The Dunlop process was developed in 1929. It was the first method used to produce Latex material for bedding. Step#2: VACUUM  This allows any amount of Latex to be evenly distributed throughout the mold creating precise and varied firmness with the finished Latex. The more liquid Latex thatand poured into the mold the firmer the resulting solid Latex. Therefore, if less liquid Latex is used, a softer more supple piece of Latex results. This differs from Dunlop in that Dunlop process has very little ability to vary the firmness or feel of the finished solid product while maintaining its structural integrity. The liquid formula is poured onto a belt and you get the same, dense piece of Latex every time. The only way to soften the feel of Dunlop Latex is to add "fillers" into the liquid Latex formula which results in solid Latex that is flaky and breaks down quickly. Step#3: FLASH FREEZE  This provides Talalay with its uniquely consistent characteristic. Liquid Latex is a suspension of rubber particles in water, like a shaken snow globe. Flash freezing prevents the Latex particles from settling to the bottom while gelling into a solid product. This means that the resulting piece of solid Talalay Latex has the same consistent feel from top to bottom. A simple analogy: Talalay Latex is like a chocolate soufflé; although the process is long, your end product is a buoyant, airy, complex delight. Dunlop Latex is more like a tray of brownies; tasty, but dense and flat in comparison. But of course, all this technology won't get you anywhere without smart, talented professionals to bring all the elements together assuring great finished products are delivered to your home every time. Talalay Latex is the premier material in bedding, LI Talalay delivers a unique buoyant quality which relaxes muscles and relieves tension, lifting away the pressures of the day while you sleep. Careful attention to detail at every step makes certain this amAZ.ing feel comes through in the finished product. Start with the best ingredients - We utilize only the highest quality natural and synthetic Latex and never introduce fillers that can degrade the feel and durability of our products. Unlike other Latex manufacturers, Latex International filters the liquid Latex to remove any large particles that might affect the consistency and durability of our end products. It you think of Talalay Latex like a soufflé, it will be pretty clear that using powdered eggs isn't going to suffice - you need real, farm fresh eggs! Use the best recipe - Next, we mix our premium ingredients into a liquid Latex formula or "batter. Creating different formulas of liquid Latex "batter", we meet specific customer requests for 100% natural or more commonly used blended natural/synthetic Latex recipes. Think dark chocolate vs. milk chocolate - it's a matter of personal taste and desired product attributes. Measure Carefully - As any great baker knows, if you don't measure correctly, the soufflé will fail. Our advanced, state of the art automated systems control both the mix of the batter and the precise amount poured into each mold to attain specific results every time. 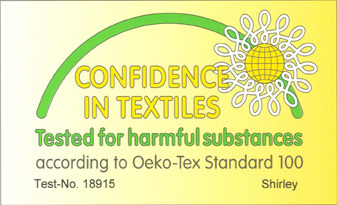 The Oeko-Tex Standard 100 (link to oeko website) is the leading global testing and certification process that ensures textile materials and home furnishing products do not contain harmful substances or pose a health risk to consumers. Very few Latex or foam producers in the world meet the standards of this independent, third-party certification. In other words, Latex International Talalay is the healthiest material you can sleep on! EMISSIONS: Our manufacturing facility does not emit any harmful elements into the air. Because of our clean process, we are not required to use any exhaust scrubbers or filtration. Our finished products don't emit harmful vapors either! Unlike memory foam, Latex International Talalay Latex rubber does not off-gas any harmful chemicals. SUSTAINABILITY: Latex International uses millions of gallons of natural Latex each year. Natural Latex is harvested from trees that help "scrub" excess carbon from our air. 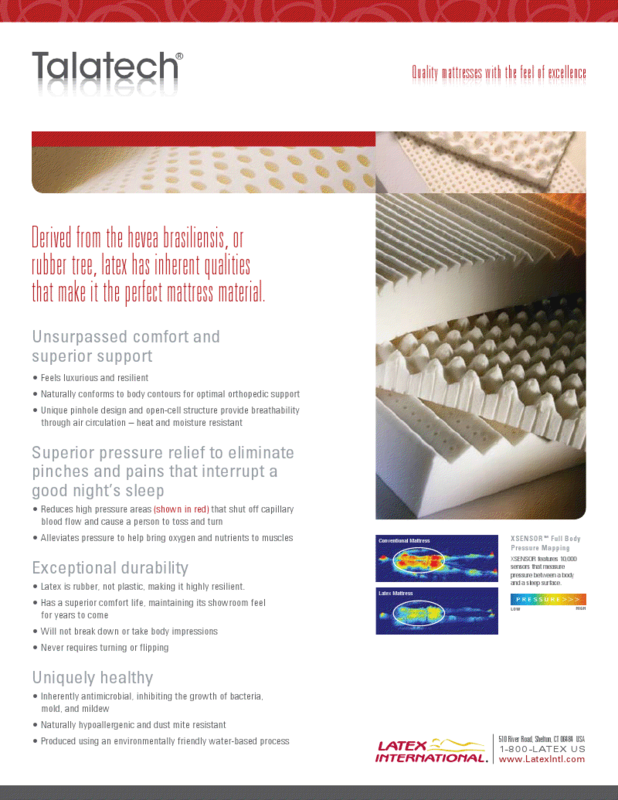 Latex International (LI) Talalay Latex provides 33% more Pressure Relief than leading Memory foam. Pressure from your mattress and/or pillow prevents your muscles from relaxing which makes it difficult to fall asleep and impairs circulation causing you to toss - turn which makes it difficult to stay asleep. This is the most rigorous and material damaging ASTM standardized test that exists for bedding components. While Latex International Talalay performs flawlessly over a period of 12 hours representing decades of use, other Latex's break down much more quickly and foams such as memory foam and polyurethane foam actually tear apart within minutes. Most people don't consider their mattress as a contributing source for respiratory problems and allergic reactions. We think of our bed as a "safe haven". The reality can be much more yucky. Mold, mildew, bacteria and dust mites love our beds - pillows. We shed millions of microscopic skin cells and perspire nearly 1 pint of water every night. The microscopic skin cells and water vapor fall through the weave of our linens and mattress cover landing on the cushioning layers below where they become a food and water source for mold, mildew, bacteria and dust mites - it can't be avoided, and it's gross. Whether your "landing pad" cushion layer is hospitable to these infestations is the controlling factor to the amount of hazardous dust created from your mattress - pillow. Foams such as Memory Foam - Polyurethane Foam are environments where these contaminants thrive, so if they compose the top cushion layers of your mattress you may have a problem. Independent testing shows that Latex International Talalay Latex is mold, mildew - bacteria proof- these organisms simply won't grow on it. Furthermore, itand dust mite resistant so these critters will prefer to be elsewhere, not right next to your face as you sleep. In a perfect world all bedding products would be as safe as Latex International's Talalay Latex. The reality is that todayand technology for producing foams like Memory Foam or Polyurethane Foam simply aren't. Todayand foams may contain any or all of the following, each are known carcinogens. Because pillows are not able to be measured in the same way as block mattress material, we electronically weigh and then hand inspect every pillow for quality and consistency. This is an extra time consuming step in our process, but it is the only way to be completely sure that consumers receive the very highest quality pillows every single time. You've heard of Memory Foam mattresses, right? Now take a moment to discover why . . .
Due to this advertising, many people assume that all non-coil beds are made with Memory Foam or that Latex and Memory Foam are the same thing. This couldn't be further from the truth. Latex International Talalay Latex is 7x more breathable than memory foam. The rubber cell structure doesn't collapse. Its natural resistance lifts your body preventing collapse and allows air to flow through, creating an escape path for body heat. You won't have to continuously flip your Latex International Talalay Latex pillow or search for a cooler spot on your LI Talalay Latex bed. Our Talalay Latex is a two-dimensional material; it is simultaneously supportive and pressure relieving, where memory foam is a one-dimensional pressure reliever only. Your body sinks into and through Memory Foam until you hit a separate support layer below. Memory Foam simply can't accomplish both pressure relief and support on its own. Hitting the support layer below Memory Foam increases pressure on your body. 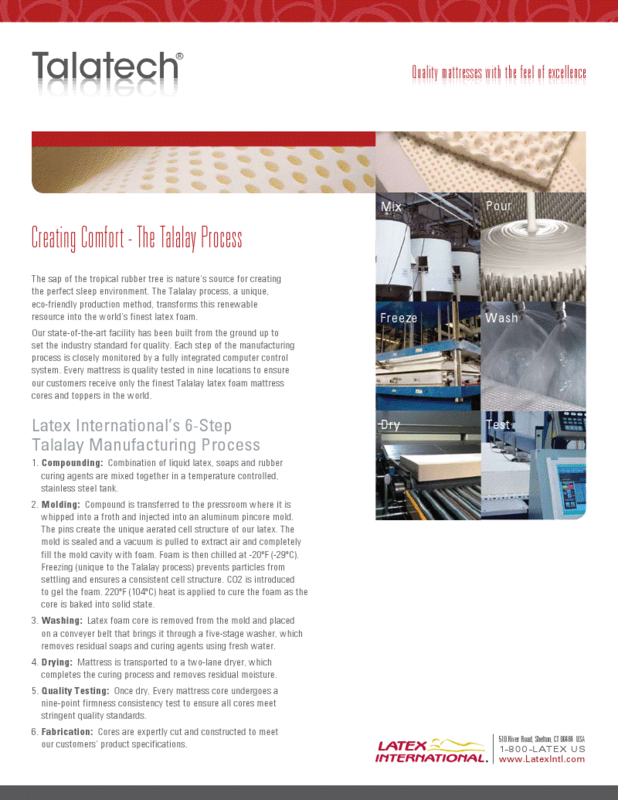 Latex International Talalay Latex is different and testing proves it. Our Talalay Latex provides 33% more pressure relief while simultaneously creating support because of the buoyant nature of Latex. Latex International's Talalay Latex material accomplishes both functions (pressure relief support) on its own so you don't bottom out on hard layers below. Memory Foam, even so called "soft" memory foam has a hard dense feel that is unappealing to many. Some call it "getting stuck in the mud" because after a few minutes your body heat collapses the cells and you sink into a hole molded to your body. It soon becomes very difficult to move or get out of bed, you become trapped in a temporary crater. Latex International Talalay Latex contains naturally based rubber material that gently lifts your body for a light, bouyant experience. Our Talalay Latex instantly conforms and moves with your body, providing postural support and exceptional muscle relief no matter what sleeping position you maintain. Latex International Talalay Latex is like floating - truly luxurious. Our Talalay Latex uses naturally derived material harvested from rubber trees that create an inherently hypoallergenic, dust-mite resistant, mold & mildew proof sleeping environment, making it ideal for allergy sufferers or anyone wanting a cleaner bed. In addition our Talalay Latex doesn't off gas harmful compounds that may be present in Memory Foam. Cornell Indentation testing proves Latex International Talalay Latex is 20x more durable than leading Memory Foam. While leading Memory Foam tears apart during this industry standard ASTM quality test, our Talalay Latex passes with flying colors. Why do people buy the Leggett and Platt S-Cape and Prodigy directly from Electropedic? Our Natural Latex Mattress Adjustable Bed Organic Mattresses; Available with the Layers, Thickness and Firmness exactly what your body needs and wants.